“The benefit of the Lord’s Supper depends entirely on the spirit and frame of mind in which we receive it. The bread which we there eat, and the wine which we there drink, have no power to do good to our souls, as medicine does good to our bodies, without the co-operation of our hearts and wills. They will not convey any blessing to us, by virtue of the minister’s consecration, if we do not receive them rightly, worthily, and with faith. 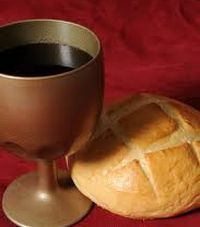 To assert, as some do, that the Lord’s supper must do good to all communicants, whatever be the state of mind in which they receive it, is a monstrous and unscriptural figment of imagination, and has given rise to gross and wicked superstition. The state of mind which we should look for in ourselves, before going to the Lord’s table, is well described in the Catechism of the Church of England. We ought to “examine ourselves whether we repent truly of our former sins–whether we steadfastly purpose to lead a new life–whether we have a lively faith in God’s mercy through Christ–and a thankful remembrance of His death–and whether we are in charity with all men.” If our conscience can answer these questions satisfactorily, we may receive the Lord’s supper without fear. More than this God does not require of any communicant. Less than this ought never to content us. Let us take heed to ourselves in the matter of the Lord’s supper. It is easy to err about it on either side. On the one hand, we are not to be content with staying away from the Lord’s table under the vague plea of unfitness. As long as we so stay away, we are disobeying a plain command of Christ, and are living in sin. But, on the other hand, we are not to go to the Lord’s table as a mere form, and without thought. As long as we receive the sacrament in that state of mind, we derive no good from it, and are guilty of a great transgression. It is a dreadful thing to be unfit for the sacrament, for this is to be unfit to die. It is a no less dreadful thing to receive it unworthily, for this is most provoking to God. The only safe course is to be a decided servant of Christ, and to live the life of faith in Him. Then we may draw near with boldness, and take the sacrament to our comfort.